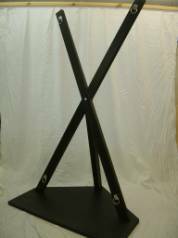 This superbly crafted free standing cross is easily assembled and can be folded away in minutes. Fittings come in stainless steel and the chain is an optional extra. Other optional extras include straps, leather and studded padding if required. Standard Cross after additional extras added. Four Red Leather Pads and Leather padded Headrest. 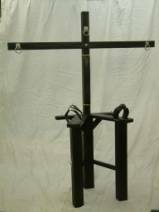 This solid free standing ‘A’ Frame is perfect for all round access to your helpless play partner. Comes with fixtures and fittings. It simply comes apart into 4 lengths for easy storage. Item.